While the thought of a wandering black hole would cause many to imagine some apocalyptic event, astronomers are rubbing their hands with glee, as it marks the first recorded evidence of one in the known universe. Based on our current understanding of galaxies, supermassive black holes are typically found in the centre. They tend to be of enormous size, some with a mass of over 10bn times our sun. There is also recorded evidence of intermediate-mass black holes that only have a mass of up to 100,000 times our sun. However, during galactic collisions, these black holes can often be ejected from the centre and gradually merge with another black hole-populated galaxy, along with the original galaxy’s stars, gas and dust. Now, a research team using NASA’s Chandra X-ray Observatory has reported the discovery of one of these ‘wandering’ black holes, dubbed XJ1417+52. Based on its findings, this black hole is moving towards the lenticular galaxy known as GJ1417+52, located 4.5bn light years from Earth. NASA has said its extreme brightness makes it likely to be a black hole, with a mass of around 100,000 suns, assuming that the radiation force on surrounding matter equals the gravitational force. The data was obtained during a period between 2000 and 2002, and revealed a staggeringly bright object known as a hyper-luminous x-ray source. These are up to 100,000 times more luminous in x-rays than stellar black holes, and between 10 and 100 times more powerful than ultraluminous x-ray sources. In fact, the readings show that XJ1417+52 is about 10 times more luminous than the brightest x-ray source ever seen for a wandering black hole. 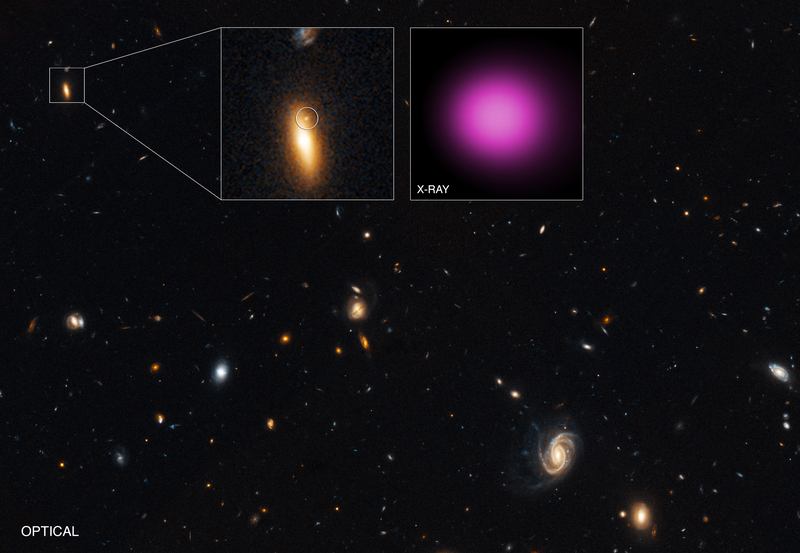 In theorising how such a bright x-ray outburst occurred, the research team from the University of New Hampshire believes the black hole could have belonged to a smaller galaxy that ploughed into GJ1417+52. This would have stripped away most of the galaxy’s stars, leaving behind the black hole and its surrounding stars at the centre of the small galaxy. The team’s research has been published in The Astrophysical Journal.